I like to think I know what I'm talking about. I have used these exact words countless times. I do TRY to take in new information and if an argument is compelling I will shape my knowledge to allow it to inhabit the space of other facts about said subject. Something interesting happens though in the area of . . . . Martial Expertise. Yes, those are two adequately big words that blanket what I will cover in the next few paragraphs. Mmm, delicious vocabulary. I sat and thought and so on for a few hours and tried to wrap my head around what I wanted to say specifically, but your gonna get the incoherent ramblings I'm so well known for. Hold on and try to keep up. I've been researching and interested in Martial Expertise since I was very young. No surprise considering how so many children, boys and girls, have a fascination with the spectacular sight of combat and the power inherent in weaponry, especially if your body is that weapon. 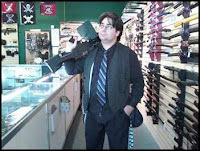 I began earnest research when I was in early high school as I taught myself the differences between functional and non-functional weaponry and practical weaponry, mostly in conjunction with re-enactment and stage combat. It was then I began to see the gap between "normal" knowledge and specialized, gasp, Martial Expertise (I might give a definition later, for the quiz of course). Not just in this specific field, but in general I was learning how people became specialized and had a wealth of knowledge concerning particular areas of study. I have noticed, in my decade-plus of time being aware and attentive to such things, That when a person attains a point of expertise, a few levels, if I may borrow from RPG terms, they become a bit aloof, sure of their knowledge and dubious at best about other peoples opinions and ideas concerning their area of expertise. There are excellent gem, exceptions to this, who walk the talk and are honest and cool and open to discuss possibilities, but these are few and far between. I can see how this can happen, I wont lie, I do it myself. Too often a person who thinks they know more than they do, with WRONG information, because they did not do research, they simple have hearsay, the accumulated knowledge of their father, their best friend who was in the military, kinda, from that movie they saw where the characters gave a detailed break down of an otherwise uninteresting weapon that was used in a cool way, and that one play they were in where they got to carry a sword. On top of all that, these people are usually the kind of people who don't know not to be these people and will not remedy their ignorance. I have seen this in martial arts with the few forays I've made into true physical combat, and understandably as movies pervert their art and there are many misconceptions. I have seen it in stage combat, where an actor, or a director or a fight choreographer has a certain way of doing things or is scared because the (chose above role in a show) proclaims to know what they're doing and have the trust of (higher up role) when most of the (lower role) think he's daft. This is also fairly typical considering how preening and proud and confident entertainers have to/try to/become. 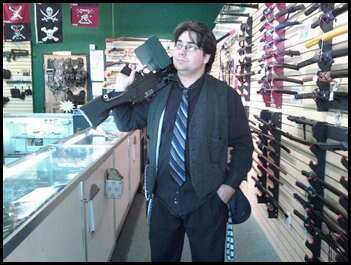 Also, of course in the area of weapon knowledge. How many metallurgist/gunsmith/blade designer/art collector/multiple cross-trained modern martial artist/multi-focused regional & era historian/ex-military people do you know that make at least an upper six figure income? Because this is really what the beast is comprised of. And not just an enthusiast of these areas, that's what I am, the above described Renaissance Man of Martial Expertise (I know, I'm sorry) must have degree's and accolades and ranks to show his legitimacy in each area. (oh, you need the income to support these habits, they are rarely inexpensive) If you don't fit that bill, you are merely a mortal amongst the rest of us. Perhaps it is all simply being jaded, a front to a world that is full of idiocy, I know I feel that way very often. Hrmm . . . I think I ran out of steam, I'm not sure if there is more to it. I hope you at least understand what I meant. I don't have any answers really, just felt I needed to share this. Maybe in the hopes that there will be less of this silliness and a greater understanding all around.